Selecting a coach training program can be confusing. There are hundreds of boutique coaching programs, educational institutions and virtual organizations that offer coach training and certification. The learning curriculum ranges vastly and many programs use their home-grown theories, models, methodology, tools and exercises to support coaches who will then be able to use this material to support clients. And then there are the advertisements that pop up and claim to offer quality training but may not. It’s challenging to discern between what is a valid or reputable program and what is just noise. Amidst the noise there is another system at work—your internal thoughts and ideas about what it means to be a coach and whether it’s the right step for you. With opportunities abounding and the demand for coaching increasing, you can become any type of coach—an executive coach, a leadership coach, an organizational coach, a career coach, a life coach, a wellness coach, a spiritual coach, a team coach, you name it! As part of writing Coaching is Calling, I interviewed over 40 administrators and coaches to gain clarity about the coaching world and learn about the training options and professional career paths that exist for coaches. 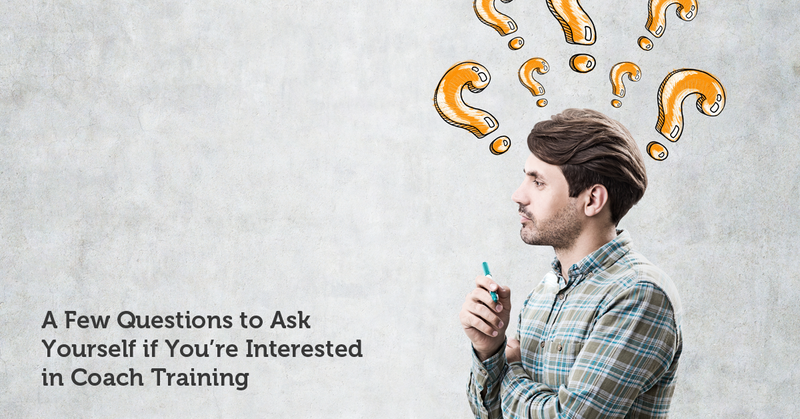 If you are considering coach training, what I want to offer you is a list of starting questions. This is not a comprehensive list but rather a way for you to begin thinking about how you can evaluate programs and decide what works best for your personal goals and ambitions. 1. Coaching goals: Why do you want to be a coach? What type of coaching do you want to do? And what kind of clients do you want to serve? 2. Coaching philosophy: What is the primary lens through which you want to view coaching (e.g. organization/systems-based, leadership, holistic/ontological)? What theories and disciplines are you interested in learning about and what type of instructors do you want to support you in your learning process? 3. Peer group and alumni community: What type of community do you want to belong to? Is it important for you to grow your network locally, nationally and/or globally? What alumni opportunities are important to you? 4. Continuous learning environment: How do you like to learn (e.g. virtual, in-person, small groups) and how do you want a program to support you? What type of coaching practice do you want to be included in the program? 5. Personal growth and transformation: To what degree are you looking for self-transformation? Are you ready to take a deep look at yourself as part of your coaching journey? 6. Coaching credential and reputation: How important is it that a program offers a credential? How important is it that a program be ICF accredited? How important is reputation to you and to your target clients? 7. Training location and logistics: What format works best with your schedule (e.g. virtual/in-person, monthly, weekends/weekdays/other)? Do you have the time, money and resources to travel to the program location? How will a program in a specific location serve your coaching goals? 8. Time and effort required: Do you have the time and energy to make a commitment to a coaching program? Is now the right time to enroll in a coach training program? 9. Cost: What is your price range (considering the payoff of finding clients to coach during and/or after the program)? 10. Support to launch a coaching business: How important is it for you to learn how to start a coaching practice as part of the program? What tools and resources do you need to support your future coaching practice?